If you follow me on Instagram or Facebook, you may know that my husband and I are expecting our first child (a boy!). We are over the moon and I have just started feeling the strong urge to nest. I’ve been told this would happen but man, it is hitting hard. 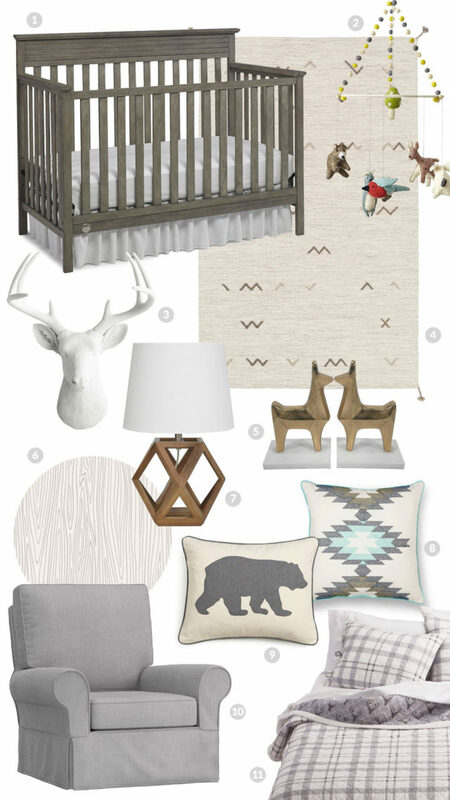 Everything from organizing, to cleaning, to purging, and the most fun (but also overwhelming) part…planning the nursery! I of course spent a bunch of time on Pinterest looking at nursery inspiration, and I have changed the direction I wanted to go a few times, but I have finally settled on a theme. If you can really call it a “theme” it is more just neutral colors with a bit of a woodland feel. I want to keep it very subtle and sophisticated and create a calming space for my baby to sleep in, and a space I like to spend time in. Here are the products that I have either already purchased or are on my wish list. What do you think of the direction? I will of course be sharing more as the nursery comes together so stay tuned! nice love the crib and the chair looks comfy! The chair is so comfy! Love the grey theme and the animal mobile is so cute! Congratulations! Thanks Kylee! Isn’t the pillow great? Congratulations on your pregnancy!! Have fun spending on baby items!! Wishing you the very best! Take care & blessings! Yes. I’m a big fan of neutral and sophisticated! First of all congrats! I bet you’s are so excited! 2nd I absolutely love this mood board.. I The neutral colour palette is just perfect! The grey looks so beautiful. I have this peaceful feeling each time I look at the picture. Congrats on your first baby and all the best on your journey! First of all congratulations on your new baby coming. This is a awesome ideas and unique too I really loved number five llama bookends. Thanks! Aren’t those llama bookends so cute? Girl I love your style. I am a huge fan of grown up looking nurserys and clothing for babies. I had my first, a little girl in August. Can’t wait to read about your LO in future blog posts. Check my blog out for helpful tips on being a first time mom. Good Luck! Any updated pictures of the nursery? I love everything you chose for it! Hi! I’ve been searching for a quilt set EXACTLY like the Sherpa one you posted! Sadly, it’s no longer available at Target. Have you seen it anywhere else?